Isleta Amphitheater is an outdoor amphitheater located within the Sandia Mountains in Albuquerque, New Mexico. Opened back in 2000 as the Mesa del Sol Amphitheater, the venue has been a destination for notable musical acts to stage summer concerts each year. Bands and artists that have frequented the venue since 2000 include the following: Dave Matthews Band, Britney Spears, Aerosmith, Neil Young, Rihanna, Red Hot Chili Peppers, Green Day, Eagles, KISS, Kenny Chesney, Van Halen, Depeche Mode, Nine Inch Nails, Incubus, Blink 182, The Fray and Kelly Clarkson. This summer, the concert calendar at Isleta Amphitheater will include the following shows: Miranda Lambert with support from Dierks Bentley on May 17; Tim McGraw on June 13; Alan Jackson on July 19; Kid Rock on July 23; Luke Bryan on July 26; Rascal Flatts with support from Little Big Town on September 7 and John Mayer with support from Phillip Phillips on October 1. Tickets for all concerts at the Isleta Amphitheater this summer can be found right here at SeatGeek. 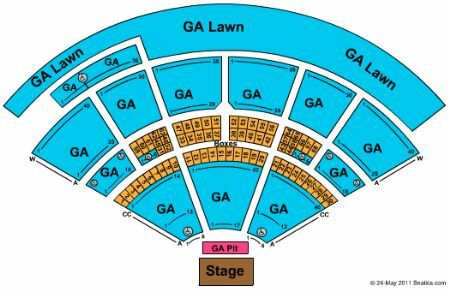 For a look at the seating chart for concerts at Isleta Amphitheater, check out the image below.